Yeasssss!! I'm def looking forward to tomorrow!!! 3 people like this. Be the first of your friends. 2 of 6 Audioagrapahy of the Greatest Martial Artist of the 20th century Dr. Moses Powell and Sanuces Ryu told by one of his original grandmaster's Grandmaster Jerry Bell. Jerry's family is not only musically blessed, but athletically blessed as well. While Jerry inherited his mother's smooth vocals; he also drew from the best of his father and imitated his every move. At 10 years old, Jerry Bell studied Judo under the guidance of his father James Edward Bell Jr., and Boxing under another family member, Muhammad Ali. At 13 Jerry was studying Karate at the East Coast Karate Association. By 17, he had traveled to Okinawa to study Okinawan Goju under Grand Master Hidegami Matsamura. Later in Japan, he studied Shotokan under Grand Master Nakayama Masatoshi, Master Ozumi Ozawa, and in the United States under Grand Master Hidetaka Nishiyama. Jerry also studied Kyokoshinkai under Grand Master Masutatsu Oyama, Shito Karate under Master Yojiro Ishikawa, and Iaido under Master Muramasa Kudo. He then studied Aikido under Master Shoji Nishoi, Silat under Master Abdul Muhammad Ben, Tae Kwon Do under Masters Simon and Phillip Rhee, and Sanuces Ryu Jujitsu under Supreme Grandmaster Doctor Moses Powell. Jerry lived more than fifteen years in the far east doing six month stays between the United States studying the martial arts and as a result speaks Japanese, Korean, Chinese and Malay. 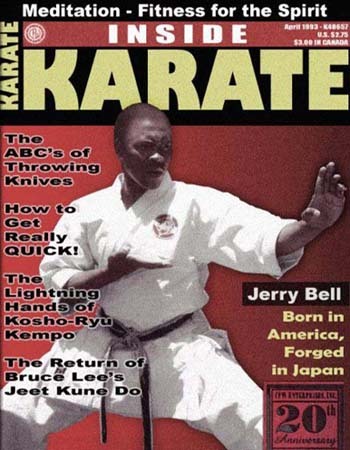 Jerry Bell entered the Kumite in Japan intent on becoming the first foreigner ever to win the traditional competition. In 1984 Jerry entered the arena long before the public arrived for his first match. He sat alone on the fight platform meditating, a practice he would continue throughout the rest of his career. During the beginning of this match, Jerry opened with a classic Ali shuffle. His Japanese opponent attempted to mimic the movement, at this point; Jerry Bell stopped, and stood perfectly still watching his opponent dance when the opponent started to move in Jerry knocked him out with a jump spinning hook kick! The following year Jerry entered and won the Kumite in another stunning victory! In 1993 “Inside Karate” featured him on the cover for their 20th Anniversary. Grandmaster Bell continued to defend his title and eventually retired after more than 500 fights; never having been defeated! The 1988 movie, "Bloodsport", starring Jean-Claude Van Damme as Frank Dux, was actually based on Jerry Bell, who fought, and won the Kumite twice. It seems Frank took credit for something he never did. Jerry also had a younger brother who was blessed with these same athletic abilities. His name was Ricky Bell. Ricky was a Running Back for both USC and for Tampa Bay Buccaneers as well as a Heisman Trophy recipient. Ricky succumbed to a blood disease in 1984. This truly was a loss for the Bell family and was one of Jerry's driving forces to strive towards greatness while continuing the Bell name with his own children while fostering their individual strengths whether it is musically or athletically. In 2004 he came out of retirement to test his skills one more time and won the championship once again; making this fight his 501st fight; again undefeated! Grandmaster Jerry Bell is now in the Black Belt Hall of Fame, The Martial Arts Hall of Fame and the World Karate Hall of Fame. He’s earned six World Gold Medals and three Silver Medals. He has a 7th degree Black Belt in Shotokan, a 4th degree Black Belt in Kyokoshinkai, a sixth degree Black Belt in Iaido, a second degree Black Belt in Judo, a fourth degree Black Belt in Aikido, a 10th degree Black Belt in Sanuces Ryu Jujitsu and a 10th degree Black Belt in the Black Ryu System that was founded by him./Jerry Bell also founded The Japan Shotoshinkai Karate-do Association in Osaka Japan with his Karate Master Yojiro Ishikawa in 1970 and he founded The Black Ryu Federation in 2003.